Tucked at a quiet corner of a mega shopping mall, Vivocity, you will find a small café – Fre(n)sh. Shouting at the top of their entrance reads “Authentic French Café & Restaurant”. 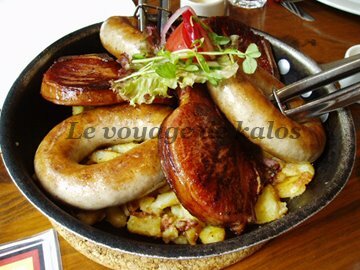 French cuisine considered to be one of the world's most refined and elegant styles of cooking, and is renowned for both its classical or grande cuisine and provincial styles. Many of the world's greatest chefs are, or were masters of French cuisine. Although this French café is not some fanciful fine dining restaurant, they do served traditional French cuisine known as Tartines, or Open Sandwiches. I tried the Smoked Salmon with Avocado Tartine, and it was good. But however it would have been better if the avocado was not in the form of a spread, but slice pieces from the fruit instead. The Crème Brulee was nevertheless outstanding – touched freshly only when you ordered; the layer of sugar coating was thin and burned to perfection. Just a simple knock with the back of the spoon enables you to enjoy the sugar coated dessert – unlike others I have tried that comes thickly coated. If you wish to have a simple meal in a quiet environment, this is the place to be. And I end off my first official entry on this blog with something I find rather amusing off the internet. Enjoy! Yep. You should go try it. It's one of the better one that I have tasted. And the fact that sugar coating it's only touched when ordered makes it even better!